One might not think how we sit in a chair has anything to do with how we run. I actually think they are very much related. Slouch in a chair all day and you might find yourself slouching during your 6 mile run. I’ve noticed that when I grade papers, my right shoulder creeps up to my ear. And I’ve also noticed that when I run, my right shoulder creeps up to my hear. One carries over to the other. I recently read this interesting article in the NY Times: The Posture Guru of Silicon Vally. I had no idea you could you could make a living out of teaching people how to sit properly, but it totally makes sense. Ms. Gokhale (pronounced go-CLAY) is not helping aching office workers with high-tech gadgets and medical therapies. Rather, she says she is reintroducing her clients to what she calls “primal posture” — a way of holding themselves that is shared by older babies and toddlers, and that she says was common among our ancestors before slouching became a way of life. It is also a posture that Ms. Gokhale observed during research she conducted in a dozen other countries, as well as in India, where she was raised. Posture matters when running. A good posture while running leads to better running form. And because our muscles have memory, having good posture while sitting will help our posture while running. Check out the posture guru here. Yesterday I ran like I haven’t run in almost two months. I ran one of the hilliest courses I know and I ran it at a pace that was kind of fast for the hills and easy pace I had originally planned. As I ran up one of the steepest hills, as I wanted to stop and walk, as I questioned why I wanted to hurt when I was suppose to be going easy, I told myself no 3 hour marathoner got there without a little hurt, no Ironman crossed the finish line without a little suffering, and my running hero, Ariana Hilborn, didn’t go from a 4:30 marathoner to Olympic Trials qualifier by walking the hills. Pain is just a part of it. Embrace it. Running Update: No running today. Tomorrow will be my longest run since February. I can’t wait! Yesterday my very wise G+ friend told me that perhaps one day I’ll look back at this race as my “breakthrough moment.” According to Google, the definition of breakthrough is “a significant and dramatic overcoming of a perceived obstacle, allowing the completion of a process.” In my heart and in my mind, I think my very wise G+ friend is right. 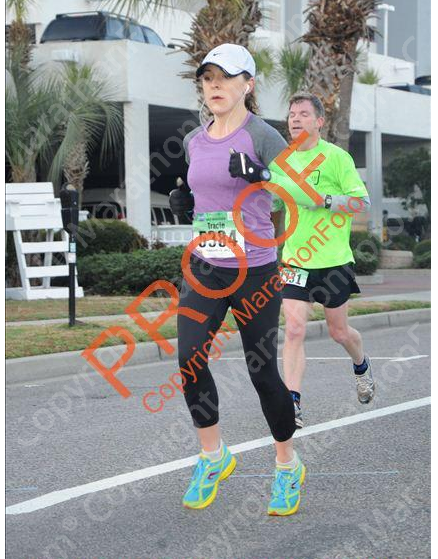 My running is cyclical. Run a lot. Get injured. Bike a lot. Forgive me when I say I am fed up with this sh*t. Why can’t I just be consistent? I learned two very important things about myself this past training season. One, I learned how much I really do love running. It’s not something I do just so I can eat my turkey burger. I really do love it and I am completely addicted. The second thing I learned about myself is I am fast and I can be much faster. I know the runner I am and I know the runner I can be. I believe my goals are well within reach and one day I will surpass them. As I’m dealing with this injury, I’m no longer mad and I’m no longer sad. Now I’m just determined. I realize that I may not be running for a month, and I’m okay with that. I’m okay with it because I want this time to really address my problems. I am reevaluating what I do, how I excel, and what my body needs that I’m not giving it. Maybe 50 miles a week is too much for me and I need to substitute a workout with cross training and strength training. Maybe my easy runs need to be about a minute slower. Or perhaps I need to do running drills every other day. I don’t know but I look at this as a complete breakdown and a chance to build myself back up. I’m not worried about losing fitness. I’m not worried about my next race. Right now, I really don’t care about those things. I care about realizing my full potential and giving my body what it needs in order to excel. I care about finding myself in this running world. I care about completing the process. Recovery Update: I’m walking much better today. I went to the doctor and it went just as I expected. It could be this or it could be that. Come to PT twice a week and let’s see how it goes. I think I now remember why I never go to doctors.